JAKARTA - Optimism for achieving the utilization target of New Renewable Energy (EBT) is growing. This was marked by the construction of 1,725 ​​Mega Watts (MW) or 1.7 Giga Watt (GW) wind power or wind power projects in various parts of Indonesia. There are 24 Wind Power Generation ( PLTB) projects in several potential locations that are being developed by private power developers or Independent Power Producers (IPPs) including Sidrap 75 MW PLTB which was inaugurated last July 2, 2018. In addition to the Sidrap Wind Power Generation ( PLTB), there are 23 other Wind Power Generation ( PLTB) projects both under construction, negotiation processes for the Power Purchase Agreement (PPA), Feasibility Study (FS), Measurement and still at the planning stage. "There are around 1,725 ​​MW of PLTB projects being developed. Starting from the planning stage to the construction stage such as the Tolo PLTB and operating like the Sidrap 75 MW Wind Power Generation ( PLTB)," said Agung the Head of the Communications Bureau, Public Private Information Service and Cooperation (KLIK) of the ESDM Ministry in Jakarta , Monday (24/9). 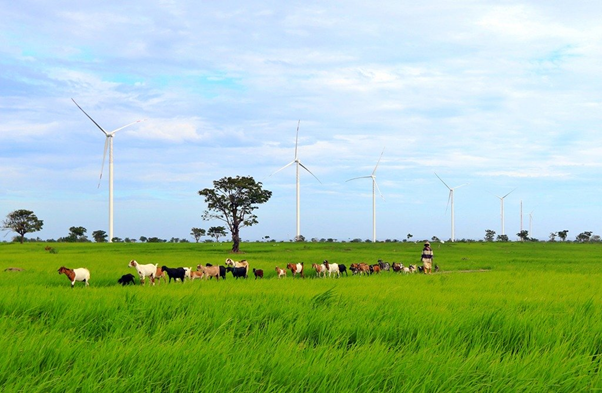 The locations of various Wind Power Generation ( PLTB) projects include Jeneponto (72 MW) which has already been constructed and Sukabumi (10 MW) which is in the PPA negotiation stage. Meanwhile, in the FS stage, the training and plans include Sukabumi (170 MW), Lebak and Pandeglang (150 MW each) in Banten, Tanah Laut (90 MW) in East Kalimantan, Jeneponto (175 MW), Sidrap Phase II (75 MW), Sidrap Phase III (200 MW), Selayar (5 MW) in South Sulawesi, Buton (15 MW) in Southeast Sulawesi, Kupang (2X10 MW), East Sumba (3 MW) in East Nusa Tenggara and Ambon (15 MW), Kei Kecil (5 MW), and Saumlaki (5 MW) in Maluku, Gunung Kidul (10 MW) in Yogyakarta, East Belitung (10), Garut (10 MW) and Timor Tengah Selatan (20 MW) and Bantul (50 MW). Furthermore, Agung expressed interest in private investors working on the potential of the wind as an EBT business field signifying increasingly competitive EBT business in Indonesia. "Improving governance such as regulatory adjustments makes it easier for investors to deposit their shares in the EBT sector. We believe this condition makes it easier for us to boost the 23% energy mix target coming from EBT in 2025," Agung explained, Monday (9/24).